Twenty-five years after a grieving father’s obsession helped turn his state into one of the strictest on repeat offenders, California leads the nation with the highest percentage of prisoners serving for life. 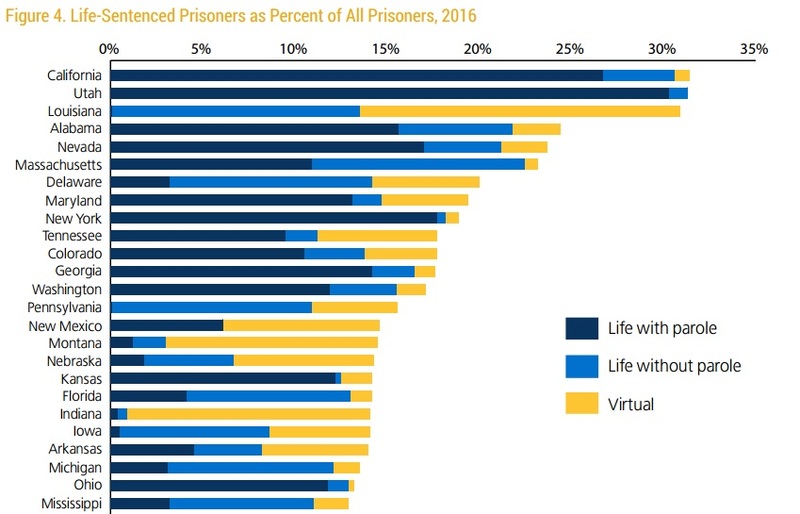 The Sentencing Project released last week a report stating that one in every seven state or federal prisoners across the country are serving life, or virtual life, sentences. State and federal numbers from 2016 show California in a tie with Utah, at 31 percent of 129,805 prisoners. 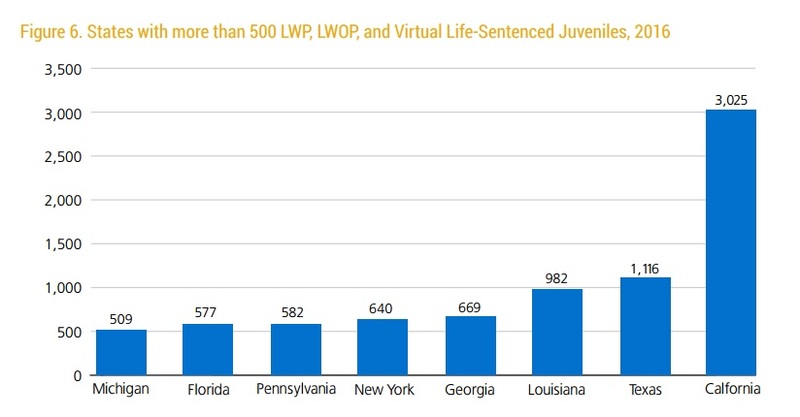 It also had the highest number of juveniles sentenced to life or virtual life, at 3,025. While California’s rank came as a surprise to the report’s author, it was less of a shock for people who work closely with the judicial system and have for years pushed for reform. In particular, they have taken aim at a 10-20-Life law, which was written by a father whose daughter was killed in the 1990s. For anyone 14 or older, the law adds anywhere from 3 years to life without probation in addition to their felony sentence if they are carrying or using a firearm at the time. Democratic state Sen. Steven Bradford made this point when he introduced SB 620 last month to the Senate Public Safety Committee, which would allow judges to consider a defendant’s individual circumstances before imposing these harsher sentences. Bradford’s report to the committee cited the economic drain these long sentences have on the state. During a 20-year boom from 1984 to 2005, California built 21 new correctional facilities that filled to capacity and increased the prison system’s expenditures from approximately $1 billion to $9.5 billion by 2014. “These enhancements cause problems. They disproportionately increase racial disparities in imprisonments and they greatly increase the population of incarcerated persons,” he said. In April, a representative for Youth Justice Coalition told the the Senate Public Safety Committee about Travis Manning. Manning was in his early 20s on Oct. 21, 2007 when he walked into a GameStop in Lynwood, Calif, with what he later told police was a BB gun. He robbed a trainee of some games, cash and a Nintendo Wii. When his case went to court, the trainee said he was sure Manning was carrying a real gun and Manning was sentenced to 18 years. “The judge stated that because of California law, he could not make any adjustments,” the woman told the committee. But a senator, the pro-gun organization Gun Owners of California and the District Attorneys Association, who were also part of the public debate, were not moved. The phrase Vranicar used was a throwback to the original tagline for the 10-20-Life law: “Use a gun and you’re done,” which was borne of Mike Reynolds’ compulsion to toughen laws after he lost his 18-year-old daughter in 1992. Reynolds’ daughter was shot in the head and killed by a paroled felon who tried to grab her purse on a summer evening in Fresno. His outrage, accusations that politicians were soft on crime and financial support from the National Rifle Association first spawned a so-called “three strikes and you’re out” law that was signed by Gov. Pete Wilson in 1994. 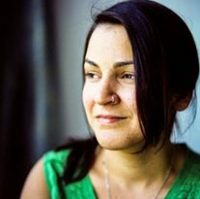 The law stiffened sentences for people who committed a second felony, and it automatically added a sentence of 25 years to life for anyone who committed a third. In 1997, 10-20-Life was his encore, and the law catapulted California to the top of the ranks for the strictest sentences in the country. Bradford told the safety committee last month that now, more than 30,000 people are incarcerated because of the law, and that number will continue to grow. His bill passed the committee with four ayes and two noes. The U.S. Supreme Court, Gov. 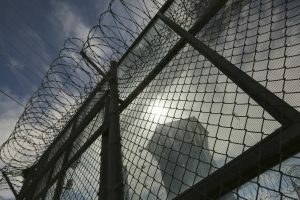 Jerry Brown and voters in the past six years have started to weigh in on California’s prisons and strict sentencing practices. In 2011, the U.S. Supreme Court ruled that California had to reduce its prison population by more than 30,000 because overcrowding and conditions violated the Eighth Amendment’s prohibition on cruel and unusual punishment. Then, voters approved Proposition 36 in 2012, requiring that the third felony of the three strikes must be serious or violent for a judge to issue a sentence of 25 years to life. Those who were serving for a third strike that wasn’t serious or violent could petition for a reduced sentence. In 2014, voters reduced some felonies such as drug possession and petty theft to misdemeanors, resulting in the release of about 4,000 people. California has since decided to afford some people parole hearings after they have served 25 years instead of 75. Voters also approved Proposition 57 in November, which was championed by Brown and took California off a list of 14 states that left the decision of whether to try youth as adults to the prosecution. Now, it’s up to the discretion of the judges. California Department of Corrections and Rehabilitation spokesperson Terry Thornton mentioned several of these recent decisions in response to The Sentencing Project’s report. Thornton said that the population peaked in November 2006, when they were at 200 percent capacity, but now they are at 135 percent, which is in compliance with the 2011 court ruling. Klement commented on why people might be surprised about California’s status in the report. “We think of ourselves as a ‘liberal’ state but I don’t think that has bled over to the criminal justice system,” he said. This article has been updated to reflect Manning’s age, that he was not required to prove he did not have a gun and to omit the claim that he did not have a previous record; he did.